Archbishop Costelloe (middle) with (from left to right) current Parish Priest Fr Phong Nugyen and previous Parish Priests Monsignor Michael Keating, Fr Peter Whitely VG and Fr Philip Perreau. Photo: Fioline Oetomo. Being bearers of God’s Word ‘into the concrete and specific world in which we live our daily lives’ was at the heart of Archbishop Timothy Costelloe’s message at the 25th anniversary celebrations of Bateman Parish’s St Thomas More Church, last weekend. Past and present clergy of the parish gathered to concelebrate Mass with Archbishop Costelloe SDB, including the Vicar General the Very Rev Fr Peter Whitely and St Mary’s Cathedral Dean Monsignor Michael Keating, together with Fr Brennan Sia, Fr Nelson Po, Fr Garner Vergara, Fr Daniel Boyd, Fr Thi Lam and current Parish Priest Fr Phong Nguyen, assisted by Deacon Bruce Talbot. The celebrations to commemorate the 25 years since the dedication of the Church building to St Thomas More saw the unveiling of a plaque on the grounds of the Church, blessed by Archbishop Costelloe. Archbishop Costelloe unveiled and blessed a plaque commemorating its 25 year anniversary on the grounds of the Church. Photo: Fioline Oetomo. 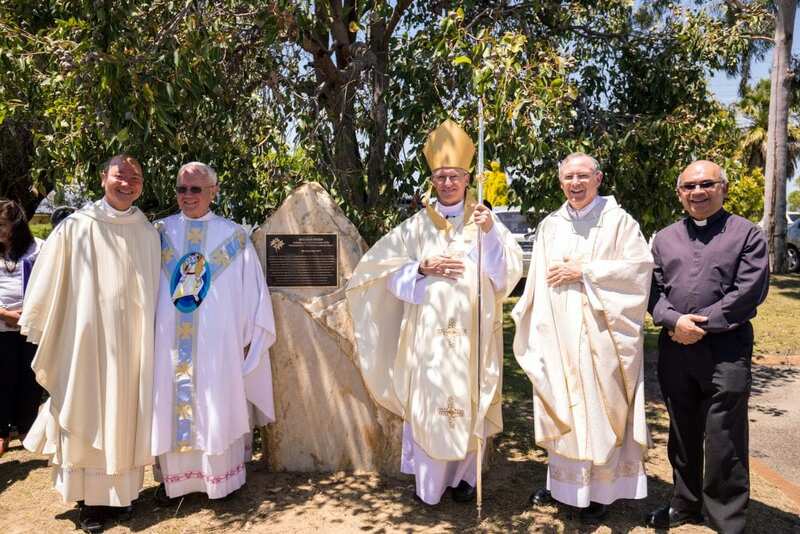 The plaque was fixed onto a stone placed by the tree which was planted by Emeritus Archbishop Barry Hickey, opposite the Church’s main entrance upon its completion in 1992. In his homily for the occasion, Archbishop Costelloe reflected on the importance of a community having Christ at its centre. “This is what makes us a truly Christian community: that we know, and understand, and experience ourselves as being a community which has Christ at its centre; Christ, who is our Way, and our Truth and our Life,” he said. “We are among those privileged people who have been called out of darkness into the wonderful light of Christ. “We are the ones who have been given the extraordinary gift of faith, not because we have earned it or because God likes us more than other people. “No, we have been given the gift of faith because in God’s mysterious plan we are the ones through whom God wishes to offer the gift of faith to others,” Archbishop Costelloe said. Archbishop Costelloe referenced the Gospel of St John, saying that the reason God has chosen us is so that we might go and bear fruit that will last. “This extraordinary privilege is, at the same time, a heavy responsibility,” he said. “When we begin to understand its importance we inevitably also begin to doubt, quite rightly, our ability to rise to this challenge and to remain faithful to this task. “For twenty five years people of faith have gathered in this Church, allowing the Spirit of God to mould and shape them into a community of faithful discipleship. Fr Phong Nguyen (left) said he has no doubts that Bateman Parish will continue to flourish and grow. Photo: Fioline Oetomo. Speaking to The eRecord, Bateman Parish Priest Fr Phong Nugyen said he was proud of parishioners who have devoted enormous energy and dedicated much of their time to the life of the parish. “I would say the people here in Bateman Parish have already lived out our motto of bringing forth the spirit of ‘a house welcome to all and a place of service to all’. “The people of our multicultural parish community have come from diverse backgrounds, bringing rich traditions with them and are now faithful citizens of this country. “Like St Thomas More, their faith in God and sense of belonging to the Bateman Parish is extraordinary and I have no doubt that our Parish will continue to flourish and grow. “Together, we can become, as Archbishop Costelloe said in his homily, a light of faith and hope not only within our parish community, but to the local area as well as the wider community,” he concluded.